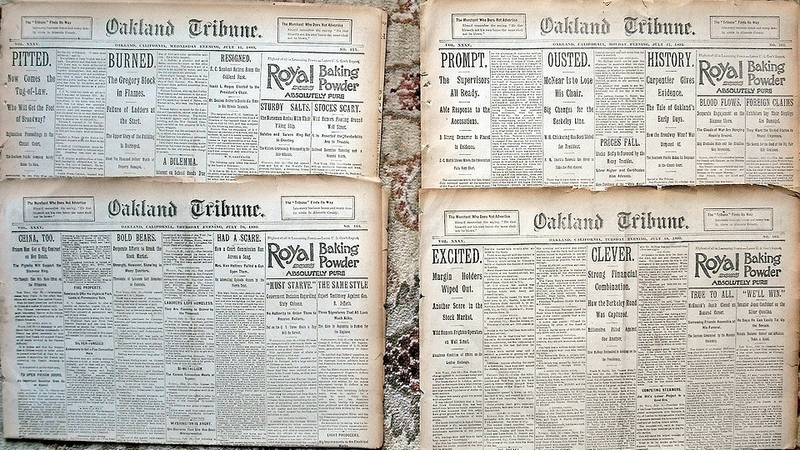 Four 1893 Newspapers STOCK MARKET CRASH WALL STREET PANIC FIRST GREAT DEPRESSION - IFA Vintage and Current Book Library - Index Fund Advisors, Inc.
Notes: FOUR ORIGINAL EDITIONS of the OAKLAND TRIBUNE (Oakland, California), for the dates JULY 12, 17, 18 and 20, 1893. All of these issues are from the Height of the PANIC OF 1893. The first GREAT WALL STREET CRASH and PANIC in American History, that led to a four year Economic Depression. Each of these 4 issues are Complete issues. 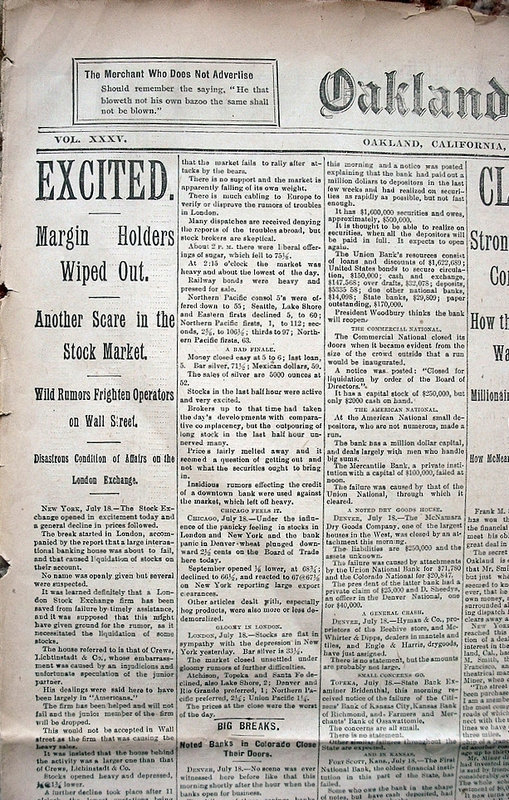 Each issue has a FRONT PAGE ARTICLE about the STOCK MARKET CRASH. There are also a number of related articles throughout these issues. A true “I WAS THERE” look at America’s biggest stock market crash and the Country’s first Great Depression. 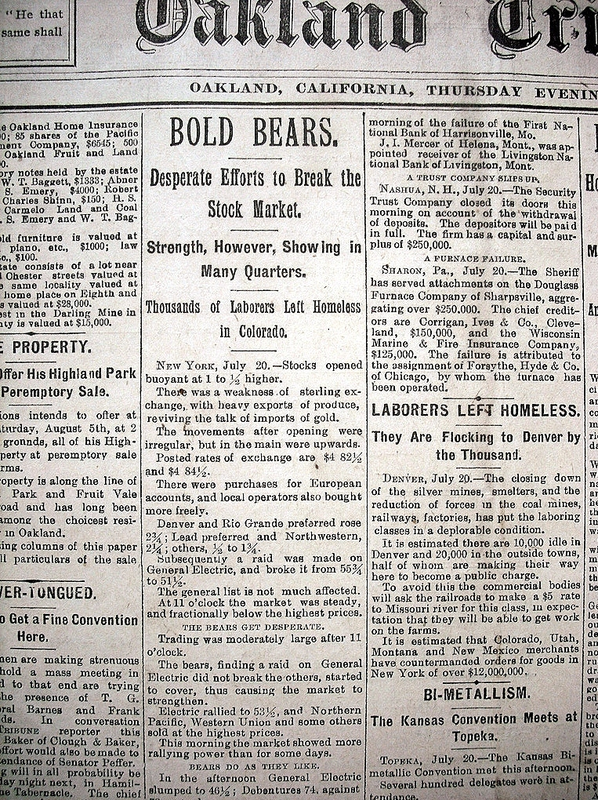 No, this is not 2008, or the coming crash of 2013, THIS IS 1893. Does Stock Market history repeat itself? Read these articles, written and printed as events were happening, and a sense of familiarity becomes overwhelming. Four Broadsheet Newspapers with horizontal and vertical folds, as originally folded for distribution. Unfolded, each page is 17” x 23”. Each issue has 8 pages. Condition: The pages are SPLIT at the spine edges (i.e. all the sheets are loose but in proper order), the edges have wear, closed tears and chipping, there are larger tears along some of the folds, the pages have toned; otherwise the issues are complete, the pages are fairly solid (though fragile with edges that chip easily), and the text is bright and fully legible. SCARCE and IMPORTANT ARTIFACTS from the FIRST MAJOR WALL STREET CRASH AND PANIC in the UNITED STATES. On May 5, 1893, Wall Street stock prices took a sudden and major drop. By the end of the year, 600 banks had closed. The Philadelphia and Reading, the Erie, the Northern Pacific, the Union Pacific and the Atchison, Topeka and Santa Fe railroads had gone into bankruptcy receivership; 15,000 other businesses went into bankruptcy. Other than the Great Depression of the 1930s, this was the worst economic crisis in US history; 15–20 percent of the workforce became unemployed. Compounding the turmoil was a run on the gold supply. The Panic of '93 was the worst economic depression the United States had ever experienced at the time. At the depression’s peak, roughly 17 to 19 percent of the workforce was unemployed. MANY PEOPLE ABANDONED THEIR HOMES WHEN THEY COULD NOT MEET MORTGAGE PAYMENTS. The Panic of 1893 swept across the United States and even crashed onto the Pacific Northwest. King County and the Puget Sound region, plunging the region into a deep economic depression that lasted four years. May 5, 1893 became "Industrial Black Friday" as railroad and industrial stocks plummeted and several major companies went bankrupt. This sparked the Panic of 1893. The panic began a four-year depression in which over 15,000 companies and 600 banks closed throughout the U.S.
ONE OF THE MOST PREDOMINANT CAUSES OF THE PANIC OF 1893 AND THE SUBSEQUENT DEPRESSION WAS THE CONTENTIOUS DEBATE OVER U.S. MONETARY POLICY.